This page contains information for Cantabile 2 users considering upgrading to Cantabile 3. 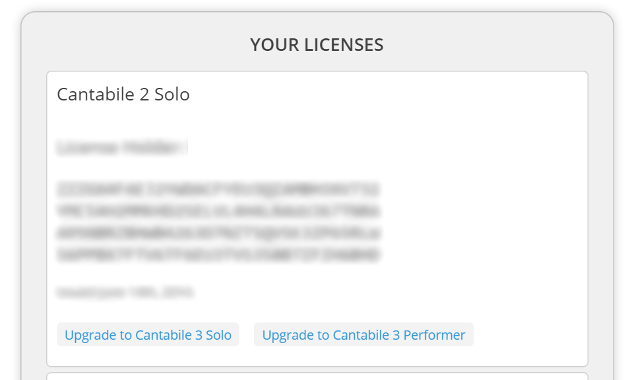 Before purchasing Cantabile 3 you should be aware that upgrading existing Cantabile 2 sessions to Cantabile 3 is not a completely automatic or transparent process. There is detailed information about this here. You can also login here, or by clicking the "Account" link in the top right of and page on the Cantabile website. If you no longer have access to the email address you're registered with, please contact me with details of your old email address, your PayPal transaction Id, or at least your full name and we'll sort it out. The subscription is for updates only. Cantabile will continue to run indefinitely even if your subscription expires - you'll just miss out on new features and updates. For a more detailed explanation on the rationale behind this, see this post. The grace period for free upgrade from Cantabile 2 to Cantabile 3 commenced mid-October alongside a price increase. If you purchased after that date you'll get the free upgrade to v3. Before that you won't get the free upgrade, but you'll have paid less in the first place. If you want to change your email address you can do so in the portal. Just click the Edit Profile button, enter your new email address. You'll be sent a confirmation message to the new email address to verify the email is correct. If you have other questions, please get in touch.